People are very busy in their work life. Only a few of them get time to break the rules and enjoy their lives. A preferable type of entertainment these days is watching TV. There are loads of channels and shows which are becoming famous among people. These shows add a little fun to life, taking the mind off the work and family tensions. But, it is a big problem if you are unable to have a clear TV screen and better sound. There are many areas where the cable TV offers a limited number of channels, and people cannot afford to pay for another handful of channels. This is where antennas hop in and provide an enjoyable television experience. High definition television antennas can reach the signals that are put out by the TV stations and bring them to your screens so you can have a colorful and seamless video experience. You can have a crystal clear picture and perfect sound with the right antenna. Antennas consist of multiple conductors, each of which has a different length. These conductors respond to the wavelength range, which then receives channel signals. There are various elements in an antenna; each of their lengths must be around half the wavelength of the signal they have to receive. The design of an antenna is just like the old analogue and DTV transmissions. Antennas have replaced the old devices. 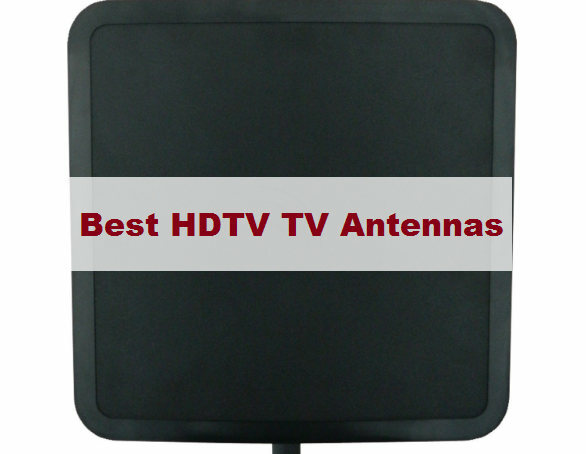 Here is a review of the top 7 HDTV antennas, which are available at different stores along with a few online shopping websites. This ranking is done on the basis of customers’ feedback and the features that come with the antenna. We hope, this review will help you in antenna shopping for your little magic box. RCA is in the field of making antennas for a long time. They provide their viewers with the best HDTV network programming, where viewers can watch their favorite programs on network and local television for free. This antenna has a simple installation with a pre-assembled design and snaps lock elements. RCA takes the edge by providing an easy-lock fold-out reflector. 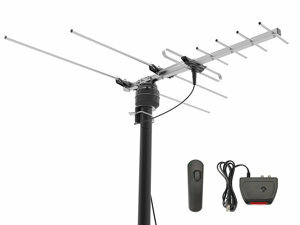 This antenna is ranked the best one because it supports up to 1080i HDTV broadcasts for the high-end quality of picture and sound. 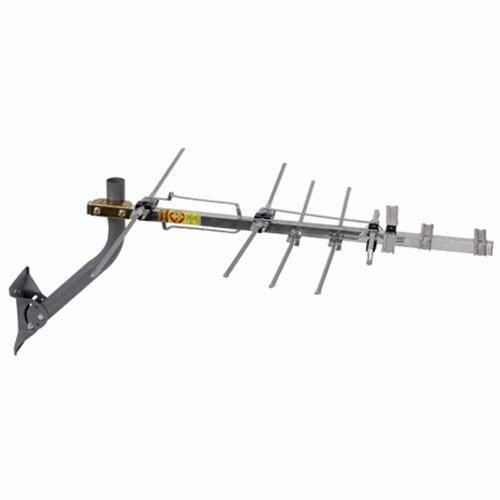 RCA Compact Outdoor Yagi HDTV Antenna has a range of 60 miles, which is successful in providing superior reception if mounted in the attic or outdoors. This antenna can withstand harsh outdoor conditions also. The packaging of the antenna includes mounting hardware, mast, locking mast clamp and 75-ohm matching transformer. It has multi-element design provides enhanced reception. It receives VHF and UHF channels. It also comes with the pre-assembled design. It also includes 75-ohm transformer. Q: Does the antenna box have a coax cable? A: No, it will have to be bought separately. Q: What are the color zones of the antenna? A: This antenna is rated for red, green and yellow color zones. Q: Can this antenna be installed through a window? A: If you drill the sash for cable, you can make the antenna work just fine for you. In case, your antenna is mounted on the external wall of the house, it must be covered to give accurate picture and sound quality. This fantastic antenna provides an excellent transmission with its 150 miles long range. It also has a 360-degree rotation and infrared remote control. It gives VHF, FM and UHF reception. With a range of 150 miles, it offers HDTV picture and clear sound with its 360-degree rotation. It also has a built-in amplifier, rotor, rotor control box and a remote for rotor control box. A 40 feet long coax cable is packed with it. It also has Dual TV Outputs. Q: Does bad weather has any effect on the reception? A: The reception of any antenna depends on the signal strength and your distance from the TV station. If both things are good, then there is no way bad weather can effect reception. Q: Is there any need to buy a control box with HDTV antenna? A: No, a control box comes with the antenna. But, in case you have an electric failure the control box may fail. Only then you will have to buy a new one. Q: Is mounting pole included in the antenna package? A: No, there is no mounting pole. You can use your PVC pipe to put it on. With its 70 miles range with an eight element bowtie quality, users can receive free TV from various networks including CBS, ABC, NBC, CW, Fox, and Univision. It provides a reception and gives a full HD 1080p output. Its multi-purpose arrangement provides flexible and easy installation. This antenna has an all weather mounting hardware and a DB8E antenna. The bowtie antennas are a superior choice for as long as 60 years. The reflector of the antenna focuses the power to provide additional range and protection against the multi-path interface. You can get full HD 1080 result. Design is a bit traditional and rest are good. Q: Can I use this antenna for more than one TV? A: Yes, it can be used for more than one TV; either with a convertor box or a digital tuner. The reception works fine for all the television sets. You just have to make sure that you are receiving great signal quality. Q: What is the distance between the 2 sections of this antenna? A: The distance between the two sections is around 27.5 inches which gives 4 inches clearance between the two grids when they are parallel to the cross brace. Q: How does the reception works if I live in mountains? A: The antenna gives great results even if you live in a forest or in between mountains. 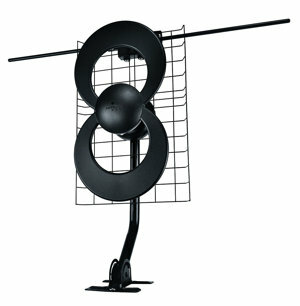 This is a great feature of this bowtie antenna, which retains the reception and signal quality. Winegard provides an HDTV reception up to 45 miles along with impedance 75 ohm. This antenna has the capability to receive H-VHF and UHF signals. 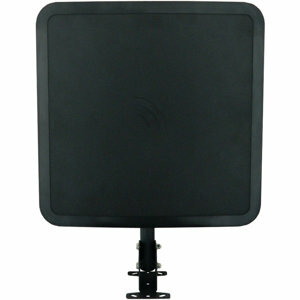 Winegard antenna has a high gain on both VHF and UHF frequency for uninterrupted DTV. This antenna may not have high reception, but it is a preferable option for ultra efficient transfer of digital signals. Users can enjoy Dolby Digital Surround Sound and watch all their favorite shows. You can get Dolby Digital Surround Sound. It has a limited range. This antenna can become the future of HDTV with its sleek design and flex mount system. It has the ideal range of 60 miles, which enables the users to enjoy their favorite channels and shows without any disturbance. It also has a dual-band VHF/UHF driven element with integrated reflectors. Winegard provides state of the art ultra low noise split band digital amplifier to their users. It has a Dual-band VHFUHF driven element. The reception of flat wave antenna varies on the placement of the antenna and transmitting towers. With a 360 degree rotation, this antenna picks up signals from all the directions. You will never have to pay for your favorite channels ever again. You can watch all your favorite channels by getting this antenna. There is a remote control which comes with the antenna for better reception and easy installation. It allows picking up local HDTV, UHF and VHF signals. This antenna can deal with harsh outdoor weather conditions. It comes with a 50 feet coaxial cable. However, the range is limited up to 60 miles. Its reception quality offers more channels. There is no mount pole in the package. 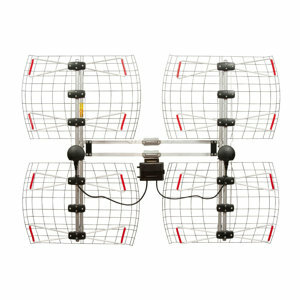 Customers claim that this antenna by ClearStream is the best one among the antennas with a 60-mile range. It gives good reception both indoor and outdoor. Viewers can enjoy their favorite channels like ABC, NBC, CBS, MeTV and others with a full HD reception. Its multi-directional elements deliver an average reception and range. The package comes with 20in mount and an all weather mounting hardware. You can enjoy full HD reception. There is no coaxial cable in the package. The US was the first one to introduce the antenna technology. They have been working on it for a long time and have come up with a variety of options in different antennas. Different manufacturers are making different qualities and designs of antennas. Each design is for a different purpose. For example, there are compact antennas, bowtie antennas, and flat wave antennas. Each of them serves a different purpose and offers a different range. There are different companies in the market, which are working on the antenna technology. Each of the company is launching new and better designs than the others to meet the requirements of their customers. People want to see their favorite shows with HD picture and sound quality. It is only possible by getting cable connection or a satellite TV. But now, people can watch their favorite channels and shows whenever they want by getting an antenna. 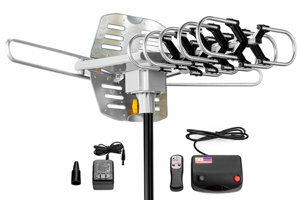 With an antenna, you get access to all the channels that are available in your broadcasting area. After you have made the buying and done with the installation, then comes the testing phase. Always ask for a trial period of 3 days at the time of purchase so you can check whether the antenna works correctly in your area or not. Even if there is a slight issue, you can call up the company representatives and ask for repair, exchange or simply guide you how to get things straight. 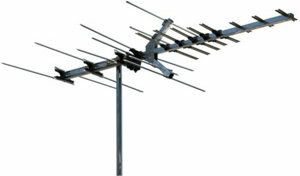 We recommend buying an antenna which fulfils all your television requirements. Do not go for something overly priced if you do not need it at the first place. Keep your geographical locations in consideration, so you do not have to regret the buying decision later on. Moreover, handle such electronic devices carefully, because if you damage them, you will not be able to get the same picture and sound quality ever again. It is better to ask one of the company representatives to do the installation; as they are professionals and it is one of their routine tasks, there are least chances of damage. Moreover, you must have the right tools if you are planning to install an antenna all by yourself. The antenna is a one-off investment. You will not have to pay for your favorite TV channels ever again. So try, not to save on an antenna if you can afford one with good quality. Always conduct a little research before you make the final verdict. Previous customers’ feedback is the best way to find out how the thing is working out for them. Although, there are other features linked to the result of any antenna you buy.